Do you remember “Say Anything” about the studious girl who’s got the world in front of her and at the last minute she falls for the ne’er-do-well? This movie is basically the realistic telling of that story. It’s the romance between Amy, a smart and genuine girl whose naivety is her own downfall and Sutter, the school clown who’s hellbent on avoiding the future. He drinks, lies, and drags her down with him but is so convincingly charming, it’s quite scary. Miles Teller just really steals the whole movie. What I love about the movie is 1.) the ending of the movie is sad and makes you question if it is truly rock-bottom or a jumping-off point and 2.) we all know people like Sutter. The one full of wasted potential who you just watch never catch up, stuck in his own fun. 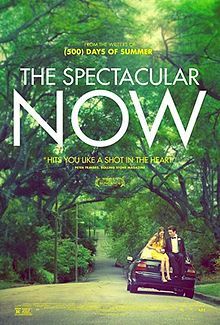 The premise of the title is this “Why worry about the future when you can live in the endless potential of the now?” This is a really dangerous mindset that my generation especially is so fond of and being a cynic and a realist, I’ve never quite understood. It’ll make you question this yourself. Out of Five: 3 1/2. Definitely worth seeing once but not a topnotch film.